This massive Walmart-owned center, which will open in July with 150 full-time associates, can move three times as many cases. It will grow to employ more than 600 associates by 2021. With the combined might of people and world-class logistic technology, this facility will be the most efficient consolidation center in Walmart’s supply chain. Walmart continues to expand its portfolio of high-tech distribution centers. In October, Walmart announced that it had broken ground on a tech-enabled perishable grocery distribution center in Shafter, California. So, what exactly is a consolidation center? Let’s take a look at what this announcement means for Walmart’s supply chain, stores and customers. Think about it this way. Let’s say there are 10 place settings on a dinner table with plates, silverware and glasses, and it’s time to clean up. If one plate is grabbed at a time, it will take 10 trips to set them all in the sink. But, if you stack the plates, cups and silverware, it only takes a couple of trips. This simple effort to consolidate makes cleaning Sunday dinner much easier. 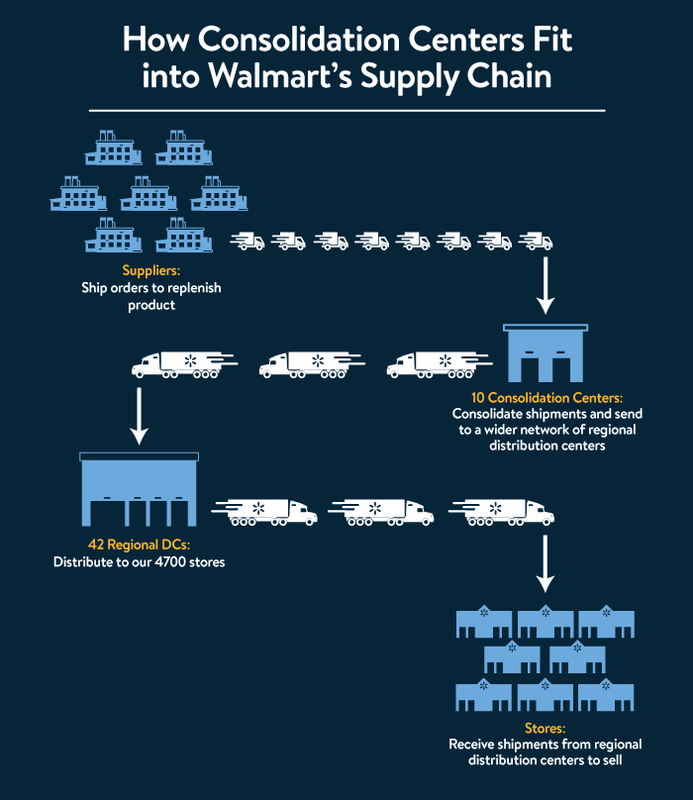 That’s essentially what consolidation centers do in Walmart’s supply chain: They take multiple orders and consolidate them to make the process more efficient for distribution centers across the country. Walmart has consolidation centers today, but the process is manual. Right now, merchandise suppliers create and ship 42 separate orders through the same consolidation center that then forwards the orders on to each of the 42 regional distribution centers where they are officially received and counted. This makes reacting to order inaccuracies a challenge, because associates may not discover them until the orders are planned to be at the store. If Walmart ordered toothpaste, and the request was accidentally fulfilled with mouthwash, associates won’t know until the product reaches the regional distribution centers. This means a customer looking for specific toothpaste brands or flavors will experience out of stocks for several shopping trips. The new system enables suppliers to fill one massive order instead of 42. New software automatically scans and counts the product immediately when it arrives and documents the information in our systems, so Walmart will be able to react faster to order-filling issues. Now, let’s go back to the 42 separate orders. Suppliers are doing all the work to sort, separate and keep track of all these orders. Most of the time, they ship the orders as soon as they are ready, which can result in trucks that are not full delivering products. This additional work adds shipping cost to the products. It also means additional trucks on the road, resulting in more carbon emissions and traffic. The technology at Colton solves these problems and creates savings we can pass on to the customer in the form of lower prices. Automating the receiving upstream in the consolidation center allows supply chain teams to group products based on how they are stocked, making unloading simpler. “We’re going to make the regional distribution centers more efficient,” said Geno Bell, senior director of the consolidation center network. This new center is also a warehouse. When it comes to reacting to unexpected events such as sudden changes in weather, having products separated and stored further upstream allows Walmart’s supply chain to react even faster to get the right products to the right places. For example, if there is an unexpected blizzard in the Northeast U.S., there will be a need for increased quantities of space heaters. If these extra space heaters are already in a regional center in Minnesota, it’s more difficult to get them to Boston. The new center in Colton will allow us to react quickly and send space heaters to New England faster, maybe even before a storm hits.